There are plenty of All-You-Can-Eat out there but this one tops the cake. Pullman Kuala Lumpur City Centre Hotel & Residences’ Chinese restaurant Tai Zi Heen has always been a crowd favorite spot when it comes to fine Chinese cuisine. 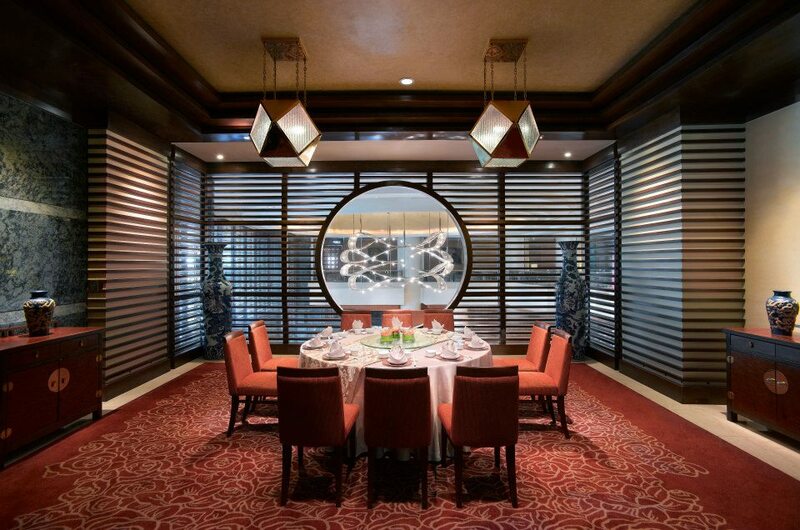 Renown for stylish creations of modern Chinese dishes reflecting flavours of Cantonese Cuisine, the restaurant is beautifully elegant in its décor. The pork free Tai Zi Heen’s Chinese Head Chef Michael Wong is aiming for lux when he created the All-You-Can-Eat Dinner menu. Filled with an epicurean’s variety of dishes, there is plenty for every diner of all ages with its selections of Appetizer, Dim Sum, Soup, Meat, Seafood, Poultry, Vegetables, Desserts and more. To enjoy more dishes, do bring a few foodies to sample more varieties on the menu. 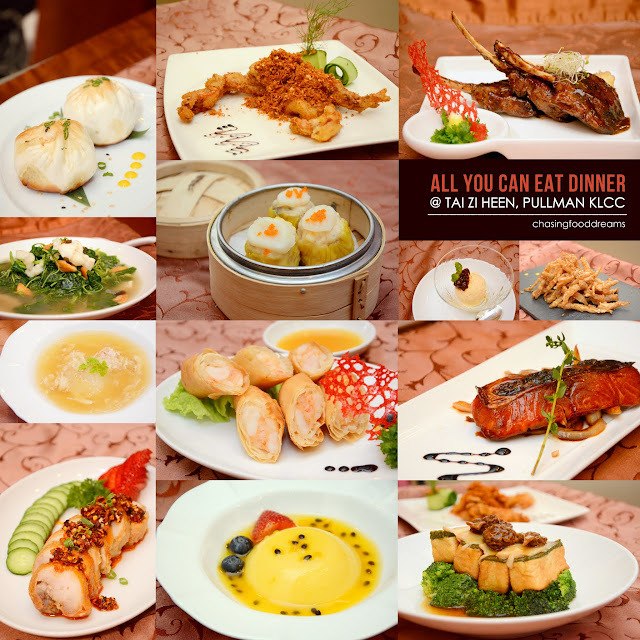 Priced at RM120 nett per adult, our All-You-Can-Eat Dinner menu kicked off with appetizers and dim sums. From light and refreshing crisp greens of Salad of Fresh Organic Field Greens with Sesame Dressing that whet our appetite for more to the superb Crispy Fried Lobster Spring Roll with Mango Chilli Dip, glorious chunks of lobster with sweet prawn meat encased in crispy thin spring roll wrapper to be dunk into sweet and fruity mango sauce. Then there’s the Traditional Peking Duck Rolls with Cucumber, Leeks and Sweet Duck Sauce, thin pancake with crisp slices of duck skin and little bits of meat with condiments, an appetizer absolutely drool worthy! Dim Sum is one of my favorite and Tai Zi Heen’s little morsels are pretty divine in flavours and textures. From the king of dim sum of Siew Mai of Chicken, Shrimp and Mushroom Dumplings Topped with Scallops to Steamed Truffles Pearl Balls Fillet with Prawn, Chicken, Carrot and Mushroom and more, the dumplings are plump and juicy with fine savory flavours. Even the Loh Mai Kai is made more lavish with their version of Glutinous Rice with Chicken, Mushroom, BBQ Chicken & Abalone as well as their pan-seared bao of Chicken Buns with Black Pepper-Seared Foie Gras. The bun is fluffy as well as crisp on one side and has a unique and tasty filling of lightly peppered and creamy filling. Moving on to soups, we couldn’t resist and tried all the three available luxurious soups. Unlimited servings of soups, one simply must try them all. Starting with the delicate supreme broth from Braised Bird’s Nest Soup with Fish Maw and Alaskan Crab Meat and its sweet crab flesh, the lightly gelatinous strands of bird’s nest not only gave the soup a lovely textural treat but has the lovely benefits of beauty nutrition too. There is the Braised Superior Broth with Seafood and Shredded Chicken, another soup that is so deliciously comforting with silky smooth broth and small chunks of seafood and meat. For those who prefer a healthy and nutritious soup, opt for the soothing and robust flavours of Double-Boiled Chicken Consommé with Lotus Root, Dried Oysters and Sun Dried Scallops. Moving on to the seafood section, our first dish of Crispy Soft Shell Crab Tossed with Buttered Oats, Garlic, Curry Leaves and Chilies was crispy and tasty. Lots of aromatics and light spicy flavours on the soft shell crab is so yummy. Then there is the soft and caramelized Baked Salmon Fillets with Honey and Onion Rings. The lightly smoky and deep rich sweetness of the salmon is sublime while the sweet onions added a delicate textural component to the fish. A Must-Order! Even bean curd is made lux with the addition of the highly prized mollusk in Braised Sliced Abalone and Morel Mushrooms with Homemade Organic Bean Curd. The house made bean curd alone is worthy of an order with its utterly delicate and velvety texture with a layer of creamy spinach. Paired with expensive abalone slices and morel mushrooms on a bed of crisp broccoli, it was also a favorite of our table of foodies that evening. More seafood with the robust and garlicky notes in the Baked Green Mussels with Garlic Mayonnaise hit our palate with much aromatic and appetizing notes. Lamb lovers will definitely enjoy the Braised Lamb Rack with Mongolian Tomato Sauce and Traditional Zhagui Fritters. Chef Wong has cleverly marinated the lamb till tender and sauced it up with a delicious sweet, savory and umami sauce. The bits of charred meat and fat is unctuously yummy. There is also the Wok-Seared Australian Beef Tenderloin with Asparagus, Fresh Shimeiji Mushrooms and Black Pepper Sauce which was tender, piquantly tasty and juicy. After all the heavy seafood and meat, we decided to enjoy some greens of Braised Young Yen Choy and Shredded Fish in a Clear Broth. Simple but satisfying, it’s a great dish of tender spinach shoots cooked in a tasty broth with small pieces of fish, century egg and salted egg. There are many more dishes that we couldn’t even try despite that there were eight of us enjoying this dinner. More dishes that I would love to try are Squid Ink Crystal Dumplings filled with Lobster Paste, Cod Fish Dumplings with Chinese Celery & Prawns, Crispy Roasted Duck with Plum Sauce, Crispy Prawns Coated with Lemon Dressing, Tropical Fruit Salsa & Tobiko Caviar, Sautéed Saltwater Prawns & Asparagus in Golden Conpoy Sauce, Wok-Fried Venison with Wild Mushrooms, Spring Onions & Thai Basil, Black Truffle Shrimp Dumplings & Noodles in Supreme Broth and Baby Abalone Porridge with Minced Chicken. We got a little greedy and decided to try all their desserts since most of us has a sweet tooth. From the Freshly Sliced Seasonal Fruits to soothing classic sweet broth of Hot Sweetened Walnut Cream with Tong Yuen, it was a nice treat of hot and cold desserts. Then there’s the King of fruit in the pale parcels of Chilled Durian Pancakes that others raved about as I enjoyed the creamy and silky Chocolate Tartlets Filled with Avocado and Cream very much. Classic Chilled Mango Pudding Served with Passion Fruit Coulis is not just pretty but so mouthwatering with bold fruity and sweet mango flavours balanced up by the tangy passion fruit sauce. The dessert that left the evening so memorable was Chef Wong’s unique Salted Egg Ice Cream with Red Bean Paste. I have never had a salted egg ice cream but this one, despite it being slightly sandy, was super scrumptious with its mix of savory and sweet flavours. I would love to enjoy this again and kudos to Chef Wong for this creative dessert! !